Juno-nominated Chloe Albert is a prolific multi-instrumental singer-songwriter. With the storytelling ability to rival the great Folk artists, her versatility and bluesy rhythms gives her a rich, authentic sound fitting easily into folk, roots, country, soul and jazz. Winning several awards plus a Juno nod, Albert’s success is a result of a diligent, hardworking artist with a sincere, irresistible, and easy-going charm. Albert has a way of projecting buoyancy without it ever coming across as saccharine. 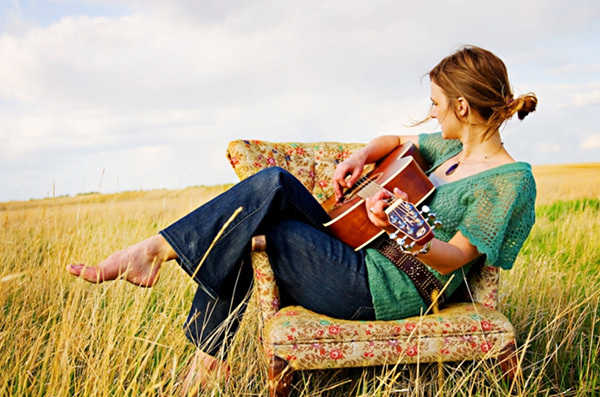 Her first Album Dedicated State (2008) won Canadian Folk Music Award for ‘Emerging Artist of the Year’. She received a Juno nomination for ‘Adult Contemporary Album of The Year’ up against the likes of Celine Dion and a Western Canadian Music Awards Nomination for ‘Roots/Solo Album of the Year’ after the release of her second album Dream Catcher (2013). Dream Catcher was the most played album on the CKUA radio network in 2014 and was on many top 10 lists. Opening the evening will be Menfolk Singing. This informal group of acapella singers has gathered once a month, for over 20 years, led by well-known folksinger Barry Luft. Barry brought a small group of amateur singers together to help him on the chorus in a few songs he was recording, and it somehow stuck. Members of the group bring songs of all sorts, from the tragic to the ludicrous. Come prepared to join in! 901 11th Ave NW, Calgary. Concerts are at 8:00 pm, with doors opening at 7:30pm. Tickets ($20) are available from Brown Paper Tickets or at the door and can be held if requested (call 403-283-4525).